Over at Forbes.com, Mark Hughes sings the praises of Warner Bros DCEU movies, especially the positive influence of the unqualified success of Aquaman. He lists Warner's upcoming DC movie release schedule through at least 2022, highlighted by a bunch of deserving super friends. However, he also points out a reality that will no doubt be a bit of a downer for Booster Gold fans everywhere. It's not exactly news that WB isn't actively working on a Booster Gold movie, but it is always a disappointment to be reminded of that fact. Visit Forbes.com for the whole article. If Booster Gold gave three news interviews and then gave seven more, how many interviews has he given in all? If Booster Gold had three costumes and Doomsday destroyed two of them, how many costumes remain? If Booster Gold had eight dollars and earned eight more, how many dollars does he have in all? If you had ten dollars and then spent three dollars on Booster Gold comics, how many dollars do you have left? 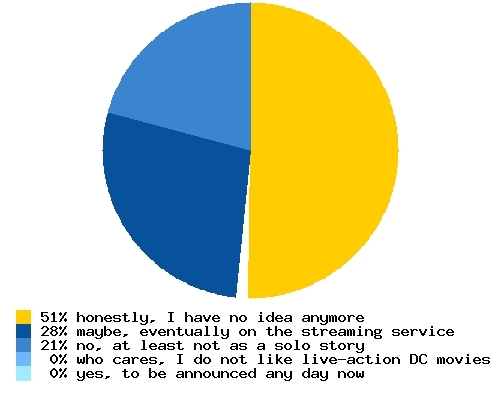 Booster Gold fans are less optimistic than I expected. I can't say as I blame you. Warner Bros certainly doesn't seem to know what they're doing, and that makes it awfully hard to have faith that they'll do our hero justice. Those of you who have lost faith may enjoy reading the somewhat rambling opinion piece "The DC Extended Universe needs to die" at Destructoid.com. I did. If Booster Gold gave four news interviews and then gave five more, how many interviews has he given in all? If Booster Gold travleled forward in time seven years and then traveled back three years, how many years forward is he now? Last week's announcement about Henry Cavill's departure from future DC Comics movies sent a lot of websites scrambling to re-report what we all thought we knew about Warner Bros' big screen plans. Some of those sites, like DenOfGeek.com (which ran an updated repost) had Greg Berlanti's Booster Gold on their list, whereas io9.com added our hero as an editorial afterthought, and Movieweb.com ignored Booster altogether. Of course, it *has* been a long time since we've gotten any real update on the progress of that venture. 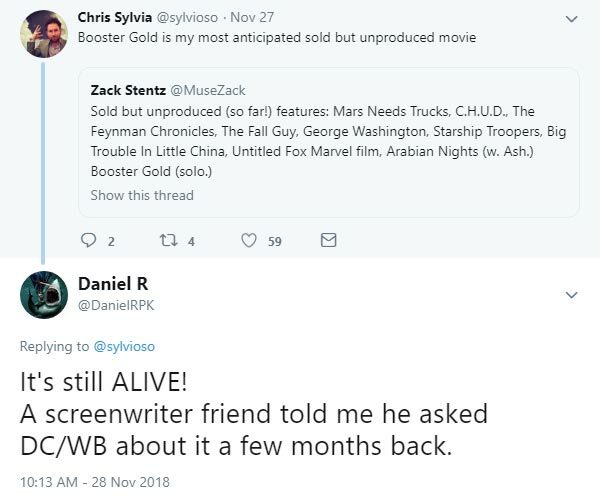 Last month, screenwriter Zack Stentz seemed to imply it was dead (or at least his involvement in it is). So let's test the mood of Booster Gold fandom on this. This week's poll question: Are you still expecting Warner Bros to release a live-action Booster Gold movie? Please visit the Boosterrific Polls page to view results for this week's poll. As a Jonah Hex fan, I’m probably okay with a Booster movie not happening. I'm sure there are a lot of Catwoman, Steel, John Constantine, and Hal Jordan fans who agree with you. Frankly, DC's live-action misses have far outnumbered their hits. Boosterrific-did you get DC all access? and if so what do you think of it? I got it and it only has 12 issues of Booster Golds 45 issue second run. It has none of the first run. And none of Rip Hunters -Time Masters. I am curious to know your thoughts. I think the secret project Kevin Smith is working on is a Booster Gold and Blue Beetle series for the DC streaming service. Wether it be live action or animated. If you owned three Booster Gold comics and then bought eight more, how many total comics do you have? If you had eight dollars and then spent five dollars on Booster Gold comics, how many dollars do you have left? Hmm. All of his projects since 2011 are "dead"? Yet Stentz "liked" the reply comment about Booster Gold? What does that mean for his Booster Gold screenplay? 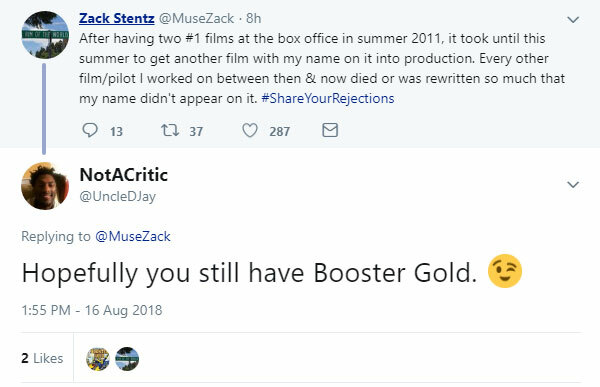 In case you were unaware, Zack Stentz is the writer of the Booster Gold movie script commissioned in 2016 by and delivered in 2017 to Flash producer Greg Berlanti. Berlanti announced as recently as May 2018 that he wants to direct it. Despite all that good news, Booster Gold: The Movie has never received any official announcement through Warner Bros, the parent company of DC Comics and the studio behind every DC movie to date. And today's tweet from the screenwriter implies that if the script isn't dead, it's at least being rewritten. If I were to venture a guess, I'd say it's not dead yet, just moving really, really slowly. Given that the upcoming DC Universe streaming service is going to need lots of new content to justify the $8/month subscription cost — which is why Berlanti has lately been working on Titans and Stargirl television series — it seems likely that any Berlanti-helmed Booster Gold project still working its way through channels would also have that destination in mind. Because that streaming service doesn't exist yet (beta testing has been announced to start sometime this month), it may be some time before Stentz's Booster Gold script, or any other, makes it into production. And, of course, if Warner Bros does decide they want to move ahead with a Booster Gold movie for the big screen, The Hollywood Reporter speculates that Guardians of the Galaxy director James Gunn is available, assuming he wants to helm a movie about a celebrity looking for redemption for past misdeeds. To know for sure if or when we might ever see Stentz's script or any Booster Gold project become a reality, we'd need a Time Sphere. Since that's even less likely than seeing a Booster Gold movie, I guess we'll just have to wait and see what we see. If Booster Gold had eight dollars and earned ten more, how many dollars does he have in all? If there were nine villains, and Booster Gold defeated nine of them, how many villains remain?